The image shows faculae, sunspots with umbra and penumbra and granulation. "Observing and imaging the Sun with modest equipment"
With a foreword by Sir Patrick Moore. My other Kindle book "Fragments" may also be of interest to astronomers who like astronomical poetry and who watched the Sky at Night TV series. 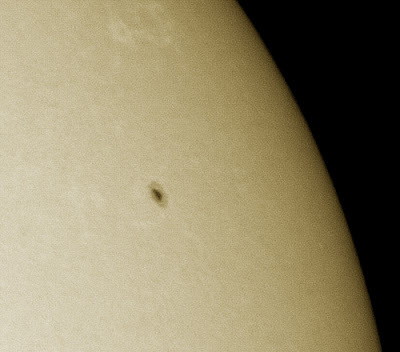 The dynamic range of the camera is such that some disk detail was visible at the same time as the prominence. Some circular interference patters are evident in the image. If the camera driver allowed the control of exposure, rather than being automatic, it would be a much better. More research is needed to find how to optimise the results.